Every month I write meal plans that are designed to feed the average family of four for about $350. While that number is low for many families, it’s a dream budget for others. There’s no doubt about it. The cost of food is steadily going up. Organic milk has gone up by one dollar per gallon in the past year and eggs have doubled in price in the past 3 months alone. It’s only $4, but even this small amount is a really big deal to some of you because there isn’t that much in the food budget in the first place. That’s one reason why I started sharing one week $50 meal plans for a family of four. When your mind is filled with concern about small paychecks and increasing costs, figuring out what to eat is sometimes just too much to handle. The first $50 meal plan didn’t include recipes – which was intentional. So many recipes were in my head, or so greatly modified from the original version, that I honestly thought it would be too confusing to try to explain it all in a single post. But you guys shared emails, made comments and requested recipes to go with these meal plans. You made your concerns loud and clear, and I heard them. Essentially the meal plans weren’t helping unless you have the whole package. 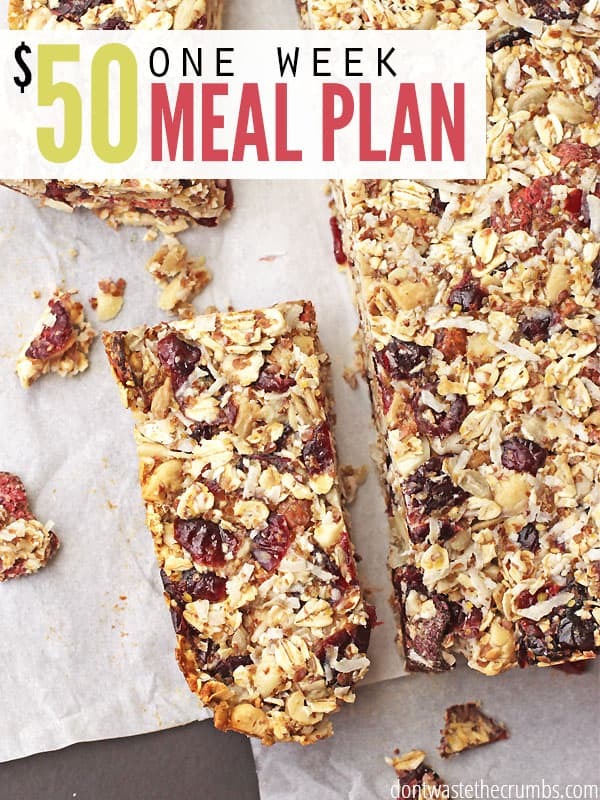 So in this $50 meal plan, and similar ones from here on out, you’ll find everything you need to make it happen: the plan, the shopping list AND the recipes. It’s a one-stop shop for you to feed your family of four on $50 for a whole week. 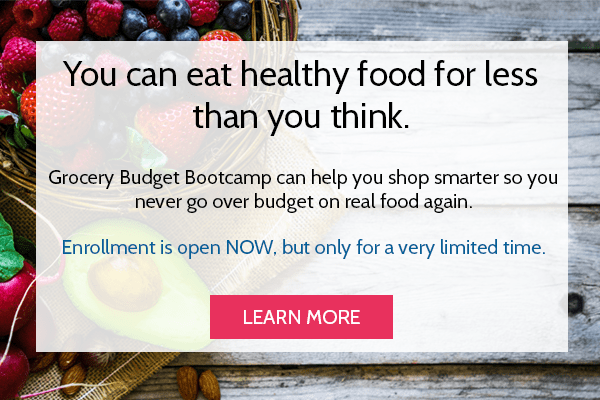 Click HERE to download the One Week $50 Meal Plan with recipes and shopping list. If you’ve ever made a meal plan before, you know that there really is an enormous amount of creativity that could go into a meal plan. From extravagant meals to flavorful sides, from weekly themes to beautiful produce. It’s a foodie’s blank canvas! But to be completely honest with you, when you only have $50 to spend on food each week, you’ve got to keep it simple otherwise you’ll blow the budget. So because of this, I created a few basic guidelines for these meal plans. This menu was created to feed the average family of four. Considerations for children (light eaters), teenagers (heavy eaters), food allergies or any other eating patterns are not included. This menu is 100% real food, but it was not written to include organic, grass-fed or any other qualities of real food. These things are great, but they’re not required for a real food diet. If your budget is only $50 for the week, these qualities need to be momentarily set aside until your financial situation can afford them. Snacks and desserts are not included. When you are forced into a very lean grocery budget, these things become luxuries. If you MUST have snacks or desserts, I encourage you to use what you already have on hand. Spices (salt, pepper, garlic powder and Italian seasoning) are not included. Most people have basic spices already, but you can include them in your budget if you don’t. The dollar store sells garlic powder and Italian seasoning for $1 each and you can find a salt/pepper combo for $1. Alternatively, leave them out of your meals. There is a meal planned for every breakfast, lunch and dinner, but eating leftovers should be priority. Not eating food you’ve already paid for and cooked is a waste of money, and when you’re going through financial crises, you can’t afford to waste anything. This menu is seasonal, so adjust produce as necessary to fit the season you’re in. Aim for $1 per pound of fresh produce, and don’t rule out frozen if it’s less expensive. Using local circulars and sales, I was able to shop this menu for $51.40. Remember that local sales and prices will vary from region to region. 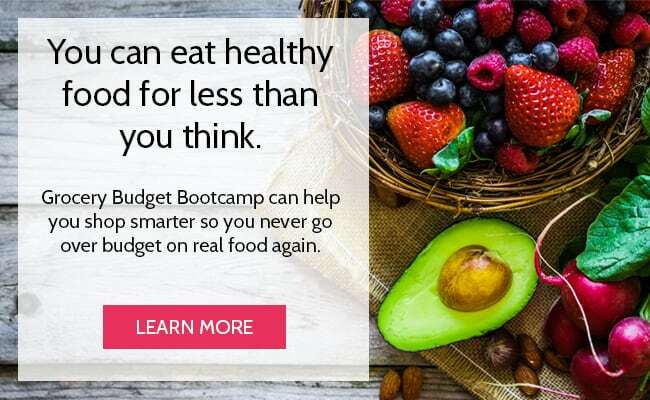 My goal is to make this $50 meal plan as complete as possible, I included a shopping list, recipes and the above meal plan in a single download for you. I also included price points so you have something to go on while you’re in the store. Real food doesn’t have to be expensive. 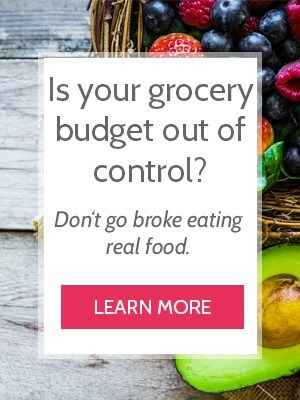 It doesn’t matter how small your grocery budget is – you can do this!! 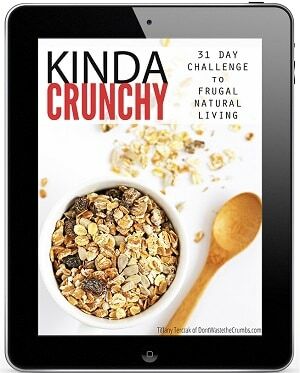 I have TONS of meal plans on this page, plus you can find the first $50 meal plan (June) here. 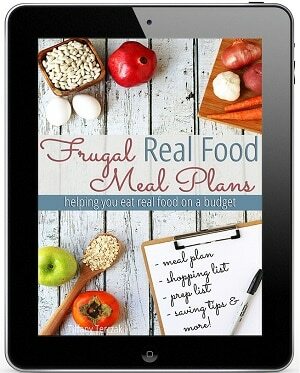 What’s your favorite super frugal meal? Leave it in the comments below and I’ll include it in a future meal plan! Should be of great help to those with really tight budgets.. 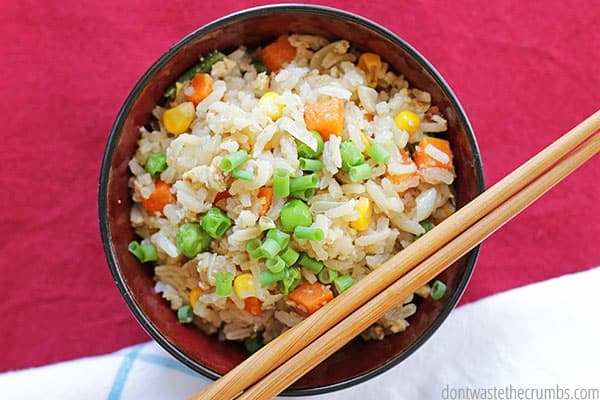 Especially in the colder months, rice with chunky soup over the rice. Often I’ll add in a bag of baby spinach with the rice. Healthy, under $6. For the whole lot and we get 4 to 5.meals out of each batch. Sliced brussel sprouts, about a pound(frozen, defrosted) couple onions, 3lbs of potatoes cooked in olive oil. Crack a couple eggs on top when potatoes are cooked, top with lid, let cook on medium until eggs are thoroughly cooked. We’ll do 5lbs potatoes on the grill, including a few sweet potatoes. Once baked through just stash in the fridge. Use for putting veggies or chili or scrambled eggs over. Fast easy. Alternates could be chili burritos or my hubby’s favorite “chips & chili dip” where you serve the chili as a dip for the serving size of chips you want, but that is the least healthy option so we rarely do it. I should add that I serve a salad with each of these meals. This is so helpful to me!! Thank you so much!! Baked Potato Soup is another super frugal one. Guy Fieri has a recipe on food network that i use as my “base recipe” but i don’t add the flour!! The mashed baked potatoes in this soup make it super-thick already!! We grew our own potatoes this year and this was a perfect use for them! Great post. My favor frugal meal is beans and rice once again like the chilli idea but Bacon bones rather than minced meat. The other I don’t make often due to new time constraints is scrappel, deb Taylor Hughs (?) Mix and match soup and skillet meals also get used a lot on busy days. This might not be a question you ladies want to take responsibility for, but I’ll ask anyway. Would YOU find this menu too small for a pregnant lady? I’m not eating Brewer diet levels of food, but I do have an appetite. 😉 We’re also trying to cut way back on spending (again), but I’m wondering how much wiggle room I have right now in the grocery budget. Any ideas on how to maybe modify this? Add milk? Just try it and see if I starve? Speaking as a pregnant woman on a $350/month grocery and household spending budget, you can do it. Choose healthy and cheap. I keep a giant tub of generic brand oatmeal to eat with various add ins. Also, stock that freezer! I make homemade waffles, banana breads, pizza dough, cornbread, muffins, etc. All are “enhanced” recipes for nutrition. I add Brewers yeast, ground pecans, oatmeal to muffins and waffles. Also keep boiled eggs, cheese chunks and cut up carrots. You can get whole carrots .99 for a bag and cut them up into snack sizes. Don’t discount coupons! I did a money maker on 40 protein powerboats last month. They are great for my purse. Tiffany this awesome!!! This list for me was focused more on clean eating instead of just frugal. A lot of people tell me it’s to expensive to eat organic. Then, I ask for their weekly meal plan and it’s usually full of garbage. Sorry to call it garbage, but if it’s not fueling your body it’s waste. Please do understand I don’t eat everything perfect for me. My diet is 90% unprocessed fresh fruit and veggies and 10% garbage…lol. I never thought of the price when shopping so my most frugal meal would 13 bean soup with our grown peppers,garlic, onion, and herbs. Thanks again and cheers to you!!! Beans and cornbread. This is a southern thing, but I can cook up a crockpot of pintos or peruano beans and we love it. Add the salt before you cook so they don’t turn to mush in the crockpot. If you cook them on low all day, they don’t need anything else, but if you have it, pork bones, a ham bone, salt pork, bacon, or even just some bacon grease will all add flavor. Another would be black bean tacos, with homemade tortillas. Thank you for your comment — I’ve had several pots of mushy beans & have waited to add salt. I will be experimenting with adding it at the beginning with my next pot! Marjorie, do you soak your beans? I couldn’t get the download to download. Check your downloads folder Phyllis – if it’s still not there, send me an email! You can often find spices in the Spanish isle for cheaper. They are in baggies and only about .5oz for less than 0.80$ but they last me a month or longer depending on how much and often I use them. 1 chicken breast, water (or broth – not so clean since I use bouillon instead), carrots, onion, and celery. I season with thyme and garlic. Great tip on the spices Casey! I’ve also recently discovered spices in the bulk foods section. I’m a Winco shopper, but I think more and more grocery stores carry them in bulk now. I haven’t had any issues with freshness (they must tun over quickly) and just buy what I need to refill my jars for a fraction of the cost. Chicken adobo is one of my favorite frugal and healthy recipes to make. Fresh ginger, garlic, Apple cider vinager, and a little soy sauce. 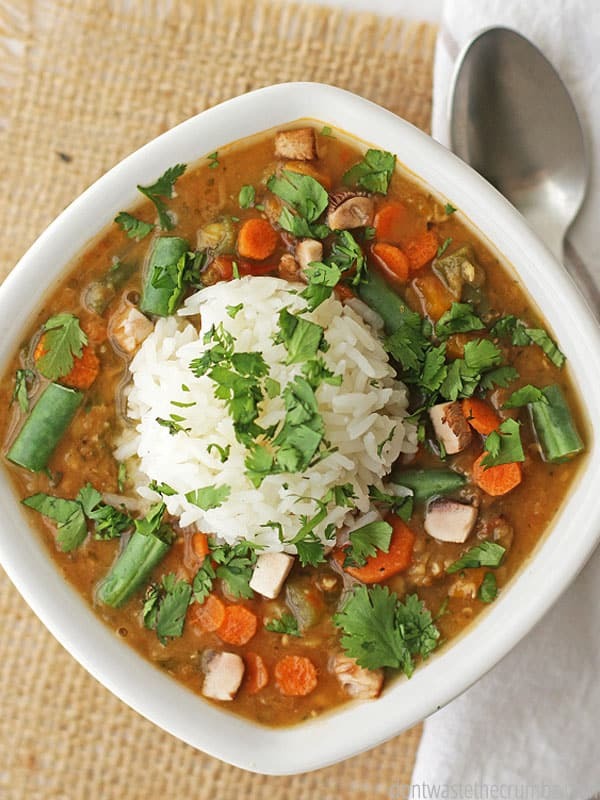 Very good in the slow cooker! If you’re in Canada, you should be able to do this for $100.per week. Aim at $1.50- $2.00 per pound for produce. And save grapes for another shopping trip. I’m in Canada and I’m totally going to see what this comes to here in Alberta. I am hoping it won’t be too much more! You’re right though, no grapes haha. My sister lives in Alberta !! I just came across this today, and I’m SO excited to get started! My husband and I have been on a tight grocery budget, but not planning well. That usually means we end up with lots of frozen burritos, hot dogs, and cereal. I’m so excited to incorporate fresh and real food into our diets once again! 🙂 thank you so much! Thank you so much for making this available to us. My husband was laid off 16 months ago, and I am constantly seeking ways to cut corners. Finding this online brought tears to my eyes, as it provided what I hope for our family (real food) but in a strict budget. Again, thank you from the bottom of my heart for making this free on your site! You’re so welcome Jill! I pray your family is able to find financial relief soon. Blessings to you! I can’t get the download to work, even on varied browsers. 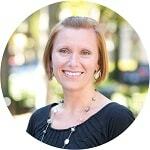 Kyleigh – I just tested the link and it works on my end. Did you check your download folders? Chicken pot pie is one of our frugal meals and most loved by our family of 5. Chicken is usually one of the least expensive meats plus making homemade crust and broth is easy and we always have carrots, celery and onion on hand. The most expensive this is usually the butter. First of all – so happy to find this today! Thank you SO much for the 50 dollar/week plan! Second – frugal meals for us – bean salad – a can of beans (pinto or black are both tasty) rinsed and drained, chop up a tomato, some onion, squeeze a lime over it, add cilantro, avocado, and some cheese if you have them – we have done without avocado and cheese – either serve over rice or dip chips in or if we are out of both we have just used a fork and eaten as is. You can spice it up with peppers if you want. Another one is chicken, spaghetti, frozen broccoli, garlic, and basil – brown chicken in skillet, toss a bit of olive oil and the garlic and basil when pasta and broccoli are hot, add chicken. You’re very welcome Sunshine! 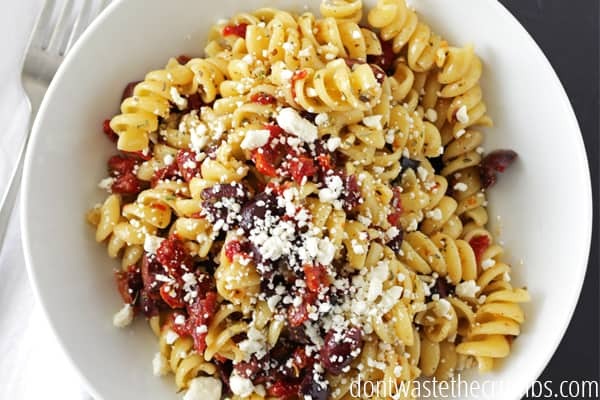 You’ve shared great frugal meal ideas for us – thank YOU! I grew up in a house where no one was ever turned away as long as there was food to go on the table. We fed a family of 12 with guests almost every night. My grandmother did all the cooking. (supervised an ever growing army of us minions anyway, like a head chef without the expensive training). I do not believe that her budget ever went over 100 dollars a week. Her mainstay was soup. We always had soup for lunch. Left overs from dinner went into the soup pot. Leftovers from breakfast, too. Add beans in the morning and pasta right before serving. Voila a meal to feed 15 or so with no extra work. I actually did not know that there were specific types of soups, i.e. potato, minestrone, chicken noodle, for many years. If we had extra soup after lunch, she would add some flour pour it into a large baking dish and top with biscuit dough and bake for stew and dumplings dinner. As a child I always ate extra helpings of foods I did not like because I knew leftovers would be added to the soup pot and I did not want to eat them again the next day. I have a small family now so I do not make the afternoon soup like she used to do. But once or twice a week I take the leftovers and cook them into the same “everything” stew but I top mine with mashed potatoes and call it shepherd’s pie. I can’t get any of the downloads to download. Are they only avaliable on a computer or can I get them on my phone (my only source of Internet)? You should be able to get them on your phone Apryl, but sometimes your device may require software to read them. These are PDF’s. I’d also check your downloads folder on your phone. This is such a helpful post. Thank you. Spaghetti, Pizza, Hamburger Gravy over mashed potatoes, rice, or bread. Hamburger gravy uses 1/4 lb ground beef browned with onions. Make pan gravy with flour, milk, salt and pepper. Serve over mashed potatoes, rice, or bread as you like. I usually didn’t have the French bread, so I made my own pizza dough which is very inexpensive to do. You can add whatever sides you wish. We also like olives, mushrooms, and bell peppers on our pizza. I watch for them on sale. I find it cooks best to put the cheese over the pasta sauce then add the toppings over the cheese. Here is a recipe my mother used to make in the pressure cooker that takes about an hour to make. A small head of cabbage if you like. If I have it, I like it. Brown meat in oil in the bottom of the pressure cooker. While the meat is cooking, peel and slice the carrots, and peel the potatoes. Let cooker cool before opening making sure all pressure is vented out. Add carrots around the meat and the whole potatoes over the carrots. You can add more onions if you like. Quarter the cabbage, place on top of the potatoes if there is room or skip the cabbage. Seal the pressure cooker, and cook another 10-15 minutes along with the meat again. I don’t thicken the juice. We like the juice over the meat and potatoes as it is. There are usually leftovers, and the next day I cut up leftover potatoes, shred the meat, and add back into the juice. Makes a good soup or good spooned over leftover biscuits. I make drop biscuits. Use 1 cup milk instead of the 3/4 cup called for in the recipe on the baking powder can. Drop by spoonsful onto baking sheet and bake – fast and easy. What herbs go into your herb bread? I have been dying to try and make bread, this recipe seemed so simple! Whatever you have! Rosemary is always popular, and oregano will make your home smell like an Italian restaurant, but a hefty shake of Italian seasoning or any dried herbs you have will work. It’s very flexible! This menu looks great!! I’ve never cooked so much from scratch so am a little nervous about it all. I work part time so am wondering about prepping ahead. Do you do any of the recipes ahead of time like on Sunday or freeze anything? Do you have any tips on which ones would be good to do on Sunday. I’m assuming the bread, tortillas, maybe butternut puree. What else? I just want it to be not too over-whelming when I get home on those days I work. Thanks! Thanks Jodi! Looking at the menu, I wouldn’t necessarily delegate time on Sunday to prep for the week, BUT I would batch cook big time on Day 1 since many of those things will be re-used later in the week. For example, I’d wash/chop fresh fruit for the whole week on Day 1, since I’m chopping anyway. Same for the veggies at lunchtime. Tortillas, rice and beans – make however much you need to get through the whole week and you’ll be covered on Day 2, Day 3, Day 4, Day 5 and Day 6. Basically, anytime you make something, look ahead to the rest of the week and see if you’re eating the same thing, or using that ingredient again (as in the case of rice and beans). Instead of cooking for just that one night’s dinner, make enough for the rest of the nights’ too. The printable is designed to help you do this, but looking at it again I’d make extra rice (day 1), prepare salsa, cook the squash, double batch pancakes (triple if you can, and freeze extras for later), maybe boil pasta for the week, shred cheese, make hard boiled eggs and bake bread. That would get you covered for sure! Enter your information below to have the Two Week School Lunch Meal Plan (including recipes and shopping list) delivered straight to your inbox!